Connor Powers, Jeff Flagg and Eddie Fernandes are aiming for Long Drive glory. The Cubs aren’t the only team in Chicago that can play long ball. 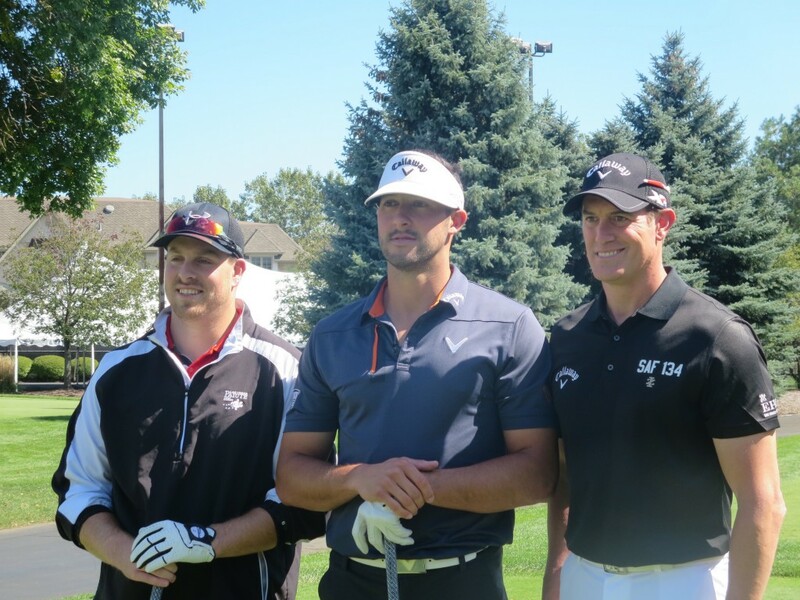 When this year’s World Long Drive championship airs on the Golf Channel on Oct. 20 and 21 (8 p.m. CT Tuesday and Wednesday), three power hitters from City of Broad Shoulders expect to be on the tee. Two already hold slots in the 64-man field: defending champion Jeff Flagg, a Chicago-area personal trainer, and 2014 quarter-finalist Connor Powers, who operates a website (deadredhitting.com) that helps young baseball hitters improve. The third contender is Eddie Fernandes, who already has won this year’s Senior Long Drive championship. Fernandes hopes to join them by advancing through preliminary rounds leading up to the finals. The connections between this trio are many-layered. Powers, who played at Benet Academy and is from Naperville, and Flagg, who grew up in Florida, were baseball teammates and friends at Mississippi State. They remained close during their minor-league careers. Powers was in the Padres’ system, Flagg was with the Mets’ organization. Flagg conducts his training business with Smart Golf & Fitness, which has locations in Lincoln Park on Chicago’s North Side, and in west suburban Oak Brook Terrace and Oak Brook. Fernandes is a teaching pro at Smart Golf’s brand-new Oak Brook facility, at the Willow Crest Golf Club. Eddie Fernandes swings; Connor Powers, Jeff Flagg and Golf Channel camera watch. In addition, Powers and Fernandes are in their second year of working out together with the Smart Golf staff, which includes teaching pro Joe Sheren and trainer Tommy Asuma. Flagg, 29, who won the world Long Drive Championship in Nevada last year, has hit a golfball 463 yards in competition. Even though he’s almost 45, Fernandes has gone 436 yards. And Powers, 27, who has attained a Long-Drive-Championship record 156 mph clubhead speed, has hit a ball 402 yards in competition, but hits much longer when he keeps his shots on the grid. “When we go play together, we’re the longest foursome around,’’ Flagg said. If not for Powers, Flagg would have missed out on success in last year’s event. After failing to qualify when he hit all six of his attempts out of bounds in Alabama, he had not planned on trying again. When Flagg came up to Chicago to visit his girlfriend, however, Powers, who was going to a qualifier in Decatur, Ill., insisted that Flagg bring along his clubs. Both wound up earning berths in the international championship in Nevada, and then played their way in the Las Vegas Eight, where Flagg picked up the $250,000 winner-take-all check. Ironically, it was Flagg who suggested long-drive competition to Powers when Powers was looking for another challenge after his minor-league baseball career ended. “I was almost over it,’’ Flagg said. “I was like, `I don’t know.’ He talked me into it. It’s crazy. That’s life-changing money. I talk to Connor a lot about this. When you go through what we did, minor-league baseball–the most I ever made in minor league baseball was $1,500 a month for five or six months, and then you have to figure something else out. And that’s playing a professional sport. I kind of joke about it. You play baseball for 20-some years. It’s your life: blood, sweat and tears. RE/MAX no longer sponsors the Long Drive Championship, which will conclude on Oct. 20 and 21 at the Winstar World Casino and Resort, about 90 minutes north of Dallas on the Oklahoma border. The purse remains $250,000, but the winner will receive $150,000 this year, with the remainder divided among the runners-up. The 6-6, 230-pound Flagg, the 6-4, 205-pound Fernandes and the 6-2, 245-pound Powers draw on different attributes to launch their imposing golf shots. The powerfully-built Powers used a Happy-Gilmore-like stride into the ball last year, but he has toned down his footwork this year. Flagg, a student of how the body works in athletics, has developed techniques in his training career that enhance his angular length. Fernandes, by far the best golfer in the trio, has dedicated himself to an all-encompassing approach that includes serious diet and gym regimens. Fernandes, who won more than 25 mini-tour events, including seven in a row, when he was trying to crack the PGA Tour, hopes to give the Champions Tour a shot when he’s eligible in five years. That’s not an impossible dream, considering that Fernandes came close to earning a Tour card via Q school. With the encouragement of his wife and children, Fernandes believes his improved length, combined with the overall game he had as a young aspiring pro, make him a genuine Champions Tour prospect. Don’t look for smooth at the Long Drive Championship, though. There, nothing less than grip-it-and-rip-it will do.